Gordon Brush Mfg Co., Inc. worked with the inventors of the PlateScrape to create an environmentally friendly, revolutionary, new, effective, and simple way to pre-sanitize dirty plates in restaurants, hotels, convention centers, and banquet halls. Gordon Brush(R) worked with the inventors of the PlateScrape to create an environmentally friendly, revolutionary, new, effective, and simple way to pre-sanitize dirty plates in restaurants, hotels, convention centers, and banquet halls. 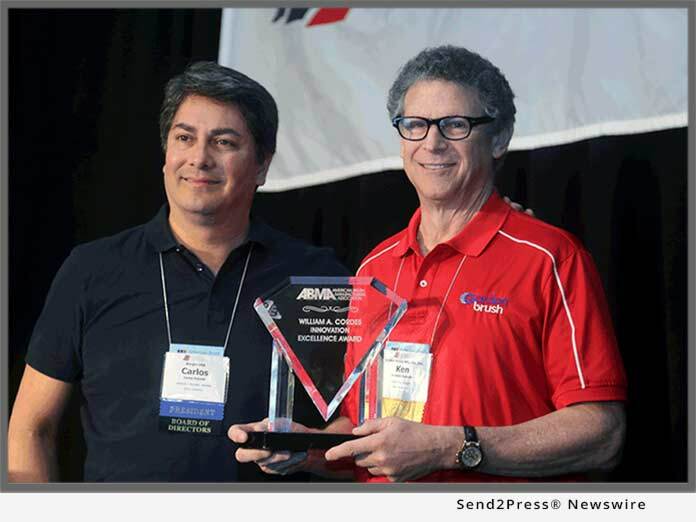 The William A. Cordes Innovation Excellence Award is given out by the American Brush Manufacturers Association (ABMA), is to recognize outstanding innovation in any manufactured product, component or service in the brush industry in any given year. The award is named after William Cordes, who served as the Association’s first President from 1917-1928. This award serves as a constant reminder that all new and exciting endeavors have beginnings that connect with real people. “The PlateScrape product will become a disruptive force in the food service industry to clean dirty plates by reducing labor time, saving billions of gallons of water, and billions of dollars in energy costs. We thank Gordon Brush for collaborating with us on this product,” said Nate Stein, President of PlateScrape. The FootMate(R) System has been featured on the Today Show and The Real TV Show, as well as in online magazines: People.com: “Stuff We Love;” CNN.com: “The Short List for Buying American;” Cosmopolitan Germany: “Beautiful Feet for the Warm Days”; Drug Store News; Bisous Magazine; Posh Beauty; Milk & Honey; and Beauty Store Business. The Company has also received Congressional Recognition from Congresswoman Grace Napolitano, United States Congressional District 32 and California State Senate Recognition from State Senator Bob Huff, California Senate District 29. Learn more at: https://www.gordonbrush.com/.